It's beginning to look like Dwayne Johnson may go up against the Justice Society of America in Black Adam. Johnson was originally set to be the villain in Shazam!, but that obviously didn't work out. David F. Sandberg's movie has recently been screened and the early reactions have been overwhelmingly positive, which bodes well for the Black Adam movie. The standalone adventure starring Johnson was first revealed back in 2007, but there hasn't been much news about it until now. It is believed that Adam Szytkiel has turned in a draft of the Black Adam script to Warner Bros. This on its own is great news for DC fans who have been waiting for any sort of update. However, the script reportedly includes Justice Society of America members Hawkman, Stargirl, and Atom Smasher. 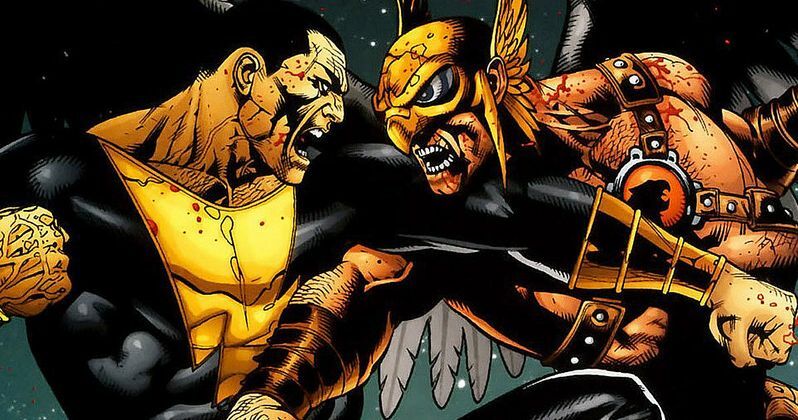 Hawkman is expected to have a major role in the movie, but what that means is unclear at this time. It's important to note that this information comes from an anonymous source, so it's best to treat it as rumor for now. Hawkman, aka Carter Hall, is one of DC's oldest heroes. Hall is an archeologist who is the reborn soul of ancient Egyptian Prince Khufu. He is one of the founders of the JSA and is often paired with Hawkgirl, aka Chay-Ara. However, there is no word if she will be involved in Black Adam or not at this time. It's a safe bet that she will at least be mentioned in the movie when it hits theaters. As for the Hawkman role, the studio is reportedly looking for an actor in the 30 to 39-year old range who can keep up with Dwayne Johnson. Stargirl, aka Courtney Whitmore and Atom Smasher, aka Albert Rothstein, are also members of the JSA. The two characters are usually portrayed as a romantic couple in the comics, but Rothstein is also an old friend of Black Adam's. In later comics, the two team up, which could be seen in the big screen adaptation of Black Adam when all is said and done. The studio is reportedly seeking an actress and actor in the 20 to 29-year old range to play the characters. Seeing Atom Smasher and Stargirl would definitely be a big deal for a lot of DC fans who have been patiently waiting for some Black Adam news. Dwayne Johnson is a busy man, but he has said in the past that Black Adam could begin shooting as early as the end of this year. However, that looks doubtful at the moment, even for Johnson's superior work ethic. But, an early 2020 start date seems plausible and the actor recently revealed that the project is still a priority of his and for Warner Bros. Let's hope that this casting information ends up being true and we get to see Hawkman, Atom Smasher, and Stargirl in Black Adam. The casting information comes to us from That Hashtag Show.